Bulging from the underside of Cumulonimbus clouds that precede or herald the arrival of a severe thunderstorm, these clouds strike fascination in awe in almost everyone who sees their beauty to behold. 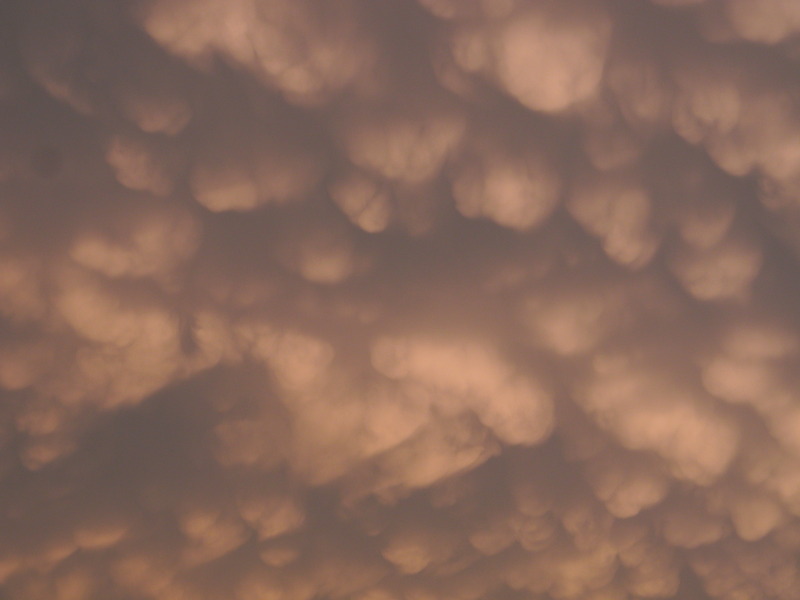 Mammatus are indicative of strong turbulence in the upper atmosphere as a result of the violent nature of thunderstorm updrafts. They can be smooth, lumpy, large, or small. They can fill a small portion of the sky, or fill the entire sky completely with mammatal goodness. A reminder of what was. with intrinsic beauty and flair. Harmlessly addicting in their majesty. All images and Poetry on this blog are original material by Jeff Miller and are (C) 2010 Jeff Miller and are the expressed property of Jeff Miller, and may not be reproduced or retransmitted in any way, shape or form, electromechanical or otherwise, without the expressed written consent of Jeff Miller. All Rights Reserved. Permission will be granted on an individual basis for reuse by request.